The number of email service providers a brand uses to send its emails reveals a lot about their email program—how sophisticated it is, the size of their email team, and much more. Whether they use a homegrown email platform is equally revealing. 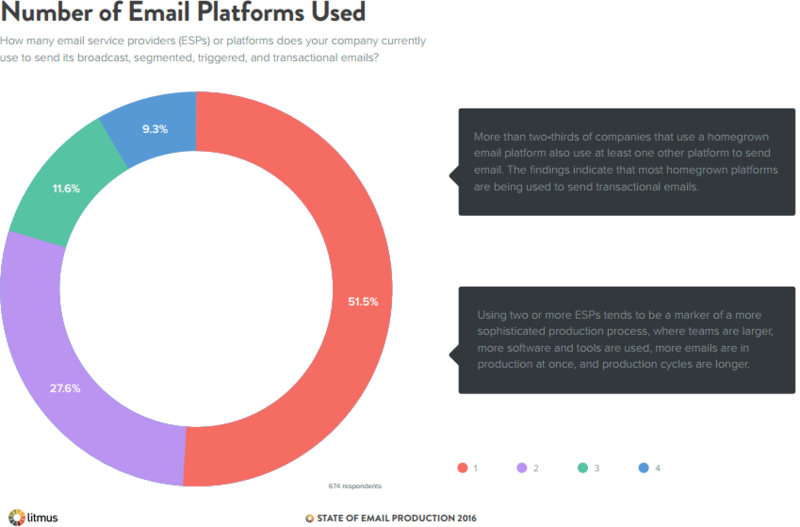 In Litmus’ 2016 State of Email Production report, we asked more than 900 email marketers which platforms they use to send their emails, among many other things. We found that brands were nearly evenly divided between those using just one platform and those using two or more, with brands using 1.8 email platforms each on average to send their marketing emails. The largest ESPs represented the majority of the specific platforms brands used. 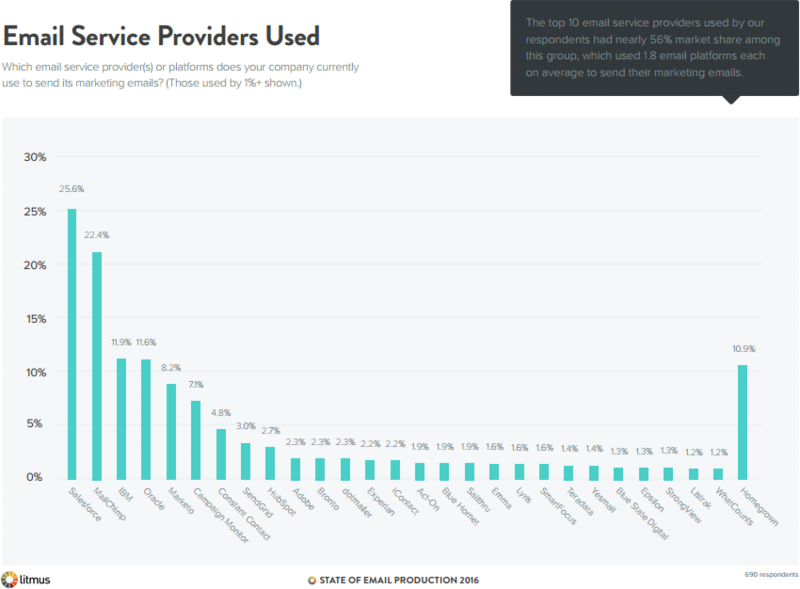 For example, the top 10 email service providers used by our respondents claimed almost 56% market share among this group. However, smaller, more niche ESPs were well-represented too. In total, our respondents used more than 100 ESPs. Completing the mix, nearly 11% of our respondents used homegrown email platforms. These platforms are developed and maintained in-house and generally trade sophistication for lower costs. Often, companies have had their homegrown platforms in place for many, many years. Digging into the data, we found that these three groups—users of 1 ESP, users of multiple ESPs, and users of homegrown platforms—had some interesting differences. While there are advantages to sending all of your emails via one platform, using two or more ESPs tends to be a marker of a more sophisticated (and more complex) production process. For instance, brands using multiple ESPs generally have larger email teams, more emails in production at once, and longer production cycles. Brands using multiple ESPs were slightly more likely to use both email agencies and freelancers. They were also a bit more likely to use software tools like Emmet, static site generators, task runners, and postprocessors — although all of those saw relatively little usage among email marketers. Users of homegrown email platforms are a bit of a mixed bag. In some ways they seemed less sophisticated, but other ways there were the most sophisticated. Some of this unevenness is likely due to the fact that one-third of these brands rely entirely on their homegrown platform to send all their email, while the remaining two-thirds use theirs in conjunction with at least one other email platform. Based on the ESPs used by this second group, it appears that most of these brands primarily send transactional emails with their homegrown platforms. There aren’t necessarily any right or wrong approaches, since every brand’s email marketing goals and needs are unique. However, there are undeniable trends among these three groups that can inform your decisions about which email platform — and how many — is right for you. 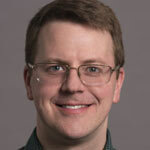 Chad White is the author of "Email Marketing Rules" and Research Director at Litmus, a provider of email creation, preview, and analytics tools. He has written thousands of posts and articles about email marketing trends and best practices—as a journalist at Condé Nast and Dow Jones & Co.; as a researcher at the Direct Marketing Association and the two largest email service providers in the world, Responsys and Salesforce; and in his current role.